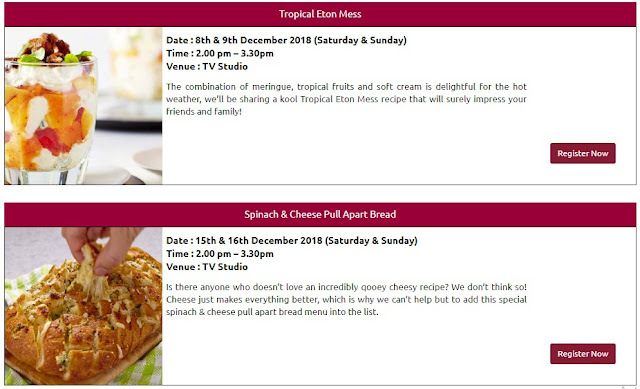 Home activity baking children Cooking Education educational Family-Friendly fun Holiday Programme KidZ vs Food 3.0 kidzania Kuala Lumpur Learning Malaysia parenting recipe Roleplay school holiday Year End School Holidays at KidZania Malaysia, Introduces "KidZ vs Food 3.0"! School Holidays at KidZania Malaysia, Introduces "KidZ vs Food 3.0"! It's the time of the year again, every year end where kids enjoy their school holiday to prepare for the new semester next year. And being parents, sometimes we wonder what are the activities that we can do with our kids with over a month long holiday break in session?! Cooking at home is fun but it'll be more fun if we have the space and also friends his age that he can relate and cook together with. Also with an expert and a safe environment is important for your child's safety. I don't encourage children to walk into your kitchen and start cooking without learning "how" in the first place. It can become hazardous! As you can see my son loves cooking so much that everytime I step into the kitchen he always begs to cook instead. But I have this fear of him hurting his little fingers because my kitchen is not CHILD-SAFE! With the gas stove on and the electrical parts running etc and handling the knife and hot water etc. You really should google up more on child safety in the kitchen and that's why I feel it's important for a child to go for a proper cooking class before actually starting from home, unless you are the expert yourself and your kitchen is safe for kids to be in. Thankfully, KidZania has answered my big ask and this year from 24th November to 31st December 2018, will be introducing to Malaysia the "KidZ vs Food 3.0" activity that will be held at KidZania Kuala Lumpur! KidZ vs Food 3.0 covers a wide holiday programme that is specially curated for kids, with daily and weekend activities of hands-on activities such as learning the ingredients, preparing food and also cooking. It cultivates your child to know how to work with and appreciate food in all its nature. The KidZania CongreZZ kids, with special guidance from (Centre – Left) Chef Brian Chen of Young Chefs Academy, cooks and serves yummy dishes to the kids from the Hilla Community Centre during the ‘KidZ vs Food 3.0’ launch. (Centre – Right) Shahrul Nizar Ahmad, Mayor of KidZania Kuala Lumpur was present to witness the serving of this special feast. Today's launch of this holiday programme, featuring KidZania's CongreZZ kids who cooked up a storm for the children of Hilla Community Centre. Hilla Community Centre kids are treated to a special lunch and playtime at KidZania Kuala Lumpur during the launch of ‘KidZ vs Food 3.0’. Together with them are (L-R) Mark Tan, Retail Sales Manager - Malaysia, Mission Foods; Sharszany Shahry, Corporate Communications Head, MAMEE; Shahrul Nizar Ahmad, General Manager of KidZania Kuala Lumpur; Esther Chong, Senior Executives Marketing Division, Kewpie; Zulhisham, Modern Trade Manager and F&N; Vincent Tan Wei Heng, Trade Marketing Assistant (Asia), Emborg. In the centre is Chef Brian Chen, Executive Chef and Managing Partner, Young Chefs Academy. KidZania CongreZZ kids prepare the food with help from Chef Brian Chen, the Executive Chef and Managing Partner, Young Chefs Academy at the launch of KidZania Kuala Lumpur ‘KidZ vs Food 3.0’ programme. With the help of professional chef 'Abang' Brian from the Young Chefs Academy (YCA), the children of Hilla Community Centre were treated to a meal of Turmeric Chicken and long beans with rice and Banana Chocolate Rolls for dessert. KidZania CongreZZ kids showcase amazing teamwork in cooking up a storm for their underprivileged friends at the launch of KidZania Kuala Lumpur ‘KidZ vs Food 3.0’. It is really inspiring to have activities such as this that truly dedicates to teaching and instilling the right skills that every child should possess. As cooking is a part of a survival skill and it's fun to explore flavours, textures and ingredients altogether. Through cooking, it will also encourage one to self-explore more into enjoying life filled with the abundance of food and ingredients all around us and at the same time instill confidence in self as they cook their own meals. This in fact, helps to nurture our children to be independent. 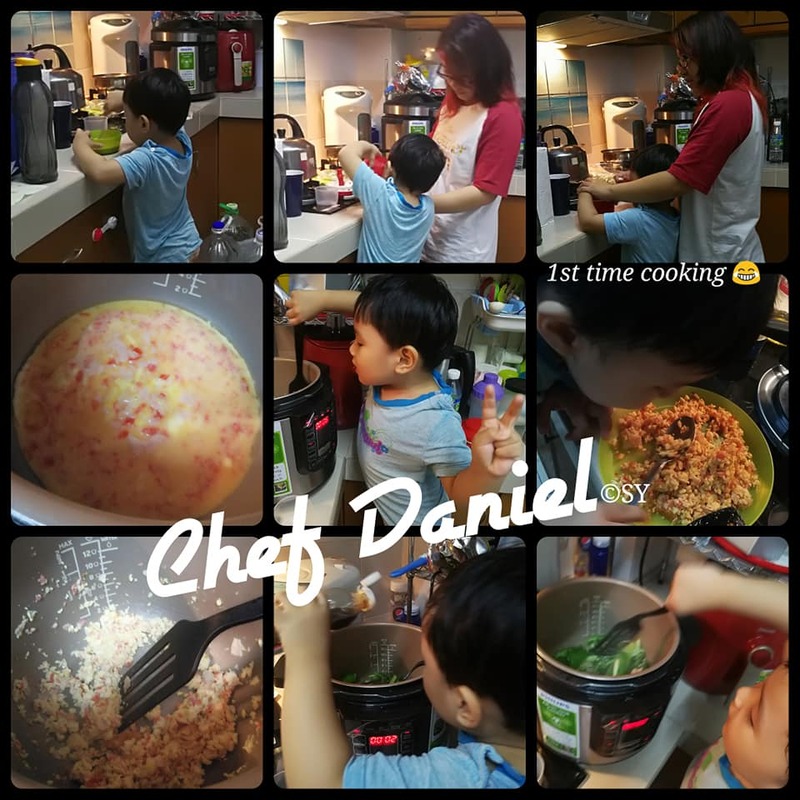 I've always wanted my son to take on my hobby of enjoying food from all over the world and if he desires to be a chef one day, who am I to reject his dreams. But I will surely bring him over to learn these basic skill while allow him to have fun and enjoy cooking in the process. Keeps me (as a parent) sane as well. #3 Food Science - A chance to get to know the food ingredients through fun play such as 'Ice Fishing"
#4 Parent & Kid Cooking Workshops - Featuring family-friendly recipes that is different every weekend, as per below, you can schedule which day to make a booking for you and your child or just make a booking every weekend because it will be so much fun that is just priceless moments worth every second of these booking bonding moments with your loved ones! Also, thanks to the valuable sponsors for making this holiday programme happen and for their support, MAMEE, Emborg, F&N, Kewpie Malaysia, Mission Foods, Malaysia Palm Oil Council, SHARP, Spritzer and Young Chefs Academy. You can also check out the schedules so that you can plan ahead your time better, especially if you're like me and would love to have your child explore all of these stations for the full experience. With these info in hand, I'm sure you would be wise enough to plan for your time with your children here at KidZania Kuala Lumpur, because you will be in good hands for sure and your child will get to learn much needed basic life skills here whilst enjoy doing so with new friends. Even though it may be a long school holiday break but not a work holiday break, just remember that 'work never really ends', but your child is growing up everyday and before you know it, they will be working like you for the rest of their lives. So take this time off and truly spend them with your loved ones because they matters most. Your work can wait another day, but your growing child can't. Don't wait until it's too late. Go plan your dates now and bond with your child! wow this is a very interesting event for kids! It's good for kids to start learning from young. Maybe future masterchef junior? 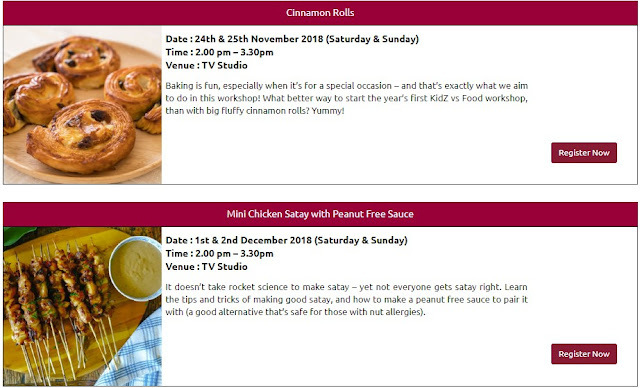 Got class to make Cinimon roll tu tak sangka budak-budak dah belajar buat yang susah-susah tu kita nak masak dulu belajar masak nasi goreng jer hehehehe wakakakak good aktiviti lah untuk cuti sekolah sekarang ni..
Bestnya program kat KidZania ni. Rasa macam eiza pula yang nak join masak. Hahaha. Tapi bagus la dedahkan dengan aktiviti macam tu kepada anak. Kena pula dengan minat anak. kidszania mmg byk perisian dia utk kanak2.. So kanak2 tak rasa bosan bila wktu sek cmni kan... Paling best dpt bersama2 dgn parents sendiri luangkan masa bersama-sama..
Now i know where to bring my niece and nephew during this school holiday. Kidzania offers a lot of attraction and of course this masak2 one will be one of their favourite as i like to bake cookies n cupcakes with them.